SPOILERS: Don’t read this review if you have not yet seen or don’t want to know details from Season 5, Episode 2 of Game of Thrones. 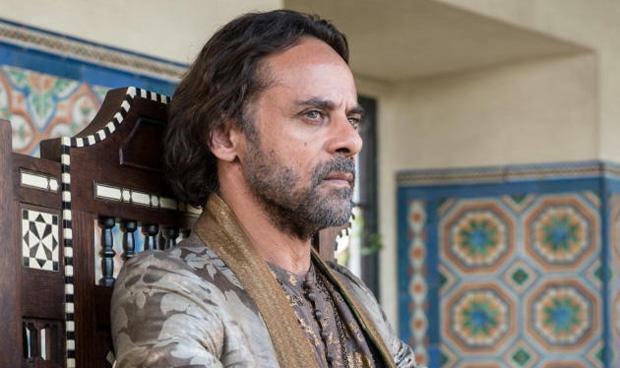 5) The moment I was MOST awaiting was seeing Doran Martell (Alexander Siddig, who you may know from his role as Dr. Julian Bashir on Star Trek: Deep Space Nine), the king of Dorne. In the gorgeous water gardens, Doran, the older brother of Prince Oberyn Martell, is sitting down b/c he suffers from gout (you can see the pain on his face in the quiet moments). What an actor… and he’s still handsome and trim! 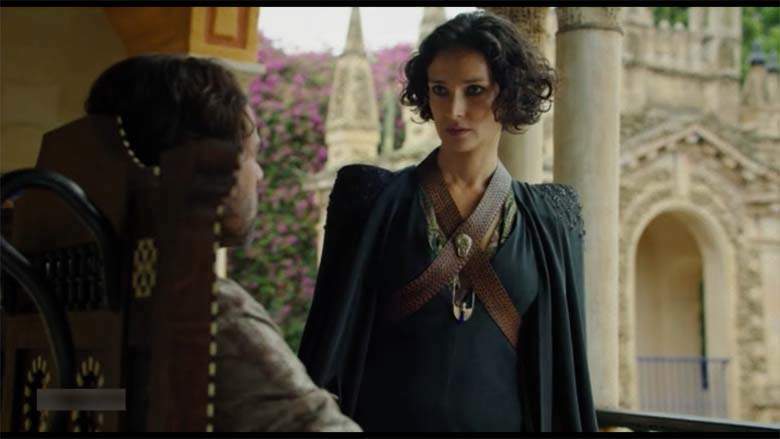 “Yes, he was my brother… long before he was anything to you!” Doran reminds Ellaria Sand (Indira Varma, now w/ her own CUTE curly bobbed hair) when she goes off on him re: getting revenge for Oberyn’s death. Ellaria (who even looks amazing in mourning) wants to kill Myrcella, who’s betrothed to the king’s son, and “send her piece by piece” to Cersei. Yikes! However, Oberyn wasn’t murdered; he died in combat (as Doran points out). 4) All of Brienne’s fight scenes w/ Littlefinger’s men- I LOVED how it was all shot, too! Sansa doesn’t know Brienne, so she refused her protection. She’ll stick with the devil she knows (Littlefinger). Hmmm… what’s with that “marriage proposal” talk? 3) Guess who’s (FINALLY) back? The Faceless Man AKA Jaqen H’gar (Tom Wlaschiha)! He’ll be a mentor to Arya Stark (Maisie Williams), as many viewers suspected. We gals want to see more Jaqen, right? 2) Dany has the young (and VERY adorable) former slave/advisor beheaded after he kills one of the Sons of the Harpy (awaiting trial in jail). His fellow former slaves hiss and throw rocks at Dany, who’s whisked away by the Unsullied. Later that night, Drogon comes to vist her for a moment before flying off. 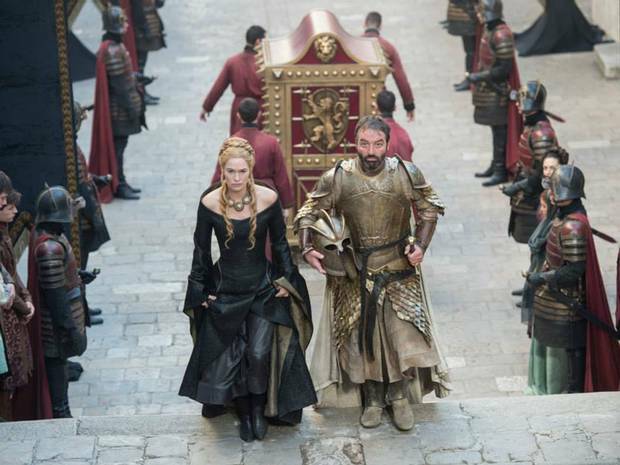 SPOILERS: Don’t read this review if you have not yet seen or don’t want to know details from the Season 5 premiere of Game of Thrones. Who is this little blonde girl? Is it Myrcella (who was taken to Dorne for her protection)? No, it’s a pre-teen Cersei (notice the same hairstyle and nasty attitude)! This is the first flashback scene in GoT, showrunner David Benioff notes. 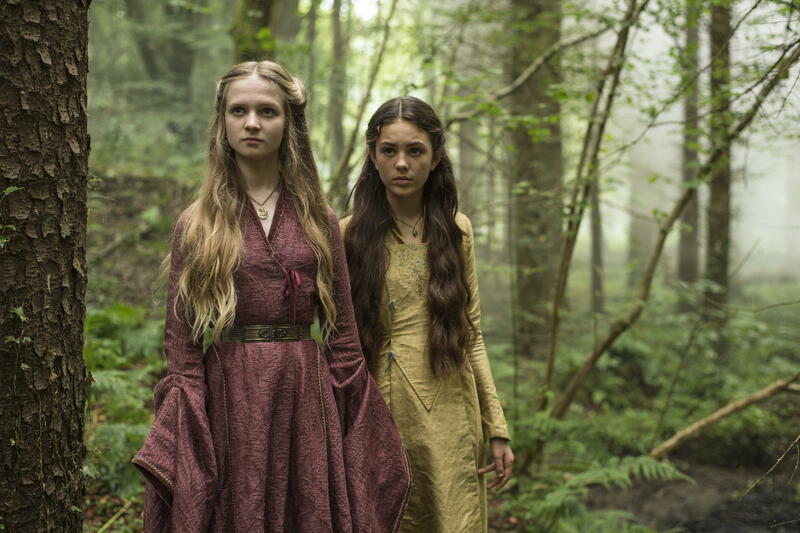 Cersei learns of her future from a witch (played by British actress Jodhi May) living deep in the woods. Instead of marrying the prince she was betrothed to, Cersei will marry a kind and become a queen. Her future husband (Robert Baratheon, of course) will have 20 children, but she’ll have 3 (as we know Joffrey, Tommen, and Myrcella). There is a cool POV shot of Tyrion (Peter Dinklage) breaking out from the crate. The fluffy beard on him shows us that a good amount of time has passed since the end of S4. Varys (Conleth Hill) says that they are at the home of his old friend, Ilyrio Mopatis (who was an ally of the Targaryens and arranged the marriage in S1). Tyrion throws up, but then continues to drink (red wine, as usual). The (main?) harpy statue is pulled down from a high pyramid and smashes to the ground. An Unsullied visits his usual pro in the city, hoping for some cuddling, but gets his throat slit by someone in a creepy gold mask and shapeless robe. 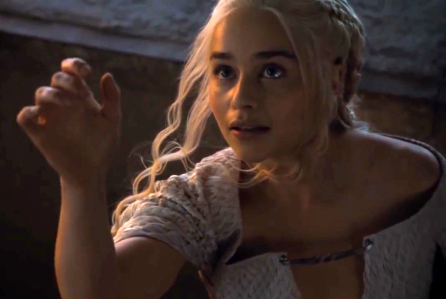 When Danerys (Emilia Clarke) and her council talk, Ser Barristan (Ian McElhinney) explains that the killer was one of the Sons of the Harpy, an “insurgent” group. Dany declares that she’s “not a conqueror.” Notice the young freed slave in her council? That young orphaned boy (from S4) is training with Jon. Gilly (Hanah Murray) asks Sam (John Bradley) why he’s not fighting (oh, please). He reminds her that he’s killed a Whitewalker and a Thenn- a rare feat for any man. (It’s cool to see Sam w/ some confidence!) Gilly worries that she and baby Sam will be sent away if Ser Alistair (Owen Teale) is chosen as the next Lord Commander. Melisandre (Carice Van Houten) comes to fetch Jon (Kit Harington, looking mature/intense). She (sorta) hits on him on the long lift up to the top of The Wall, but he’s not amused. Stannis (Stephen Dillane) asks Jon: “Don’t you want to revenge him [Robb]?” But Jon has pledged himself to The Night’s Watch. Stannis decides that Mance Rayder will either “bend the knee” or be burned at the stake. We learn that Robin Arryn is now 13, but can’t fight worth squat (to the dismay of his new protector, Lord Royce). Littlefinger (Aiden Gillen) says that some boys don’t need to fight- they have the right name/title. He gets a message (via raven, of course) and Sansa (Sophie Turner, now an even more striking young woman) wonders what’s up. 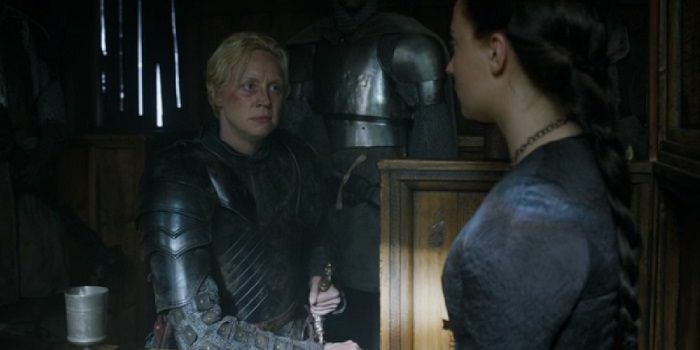 Brienne (Gwendoline Christie) is in a bad mood- she’s not really a knight, so Pod’s not a proper squire. Pod reminds her that Sansa Stark is still out there somewhere, even if Arya refused her protection. On the road nearby, Littlefinger, Sansa, and their retinue go by (irony). Guess who’s back? 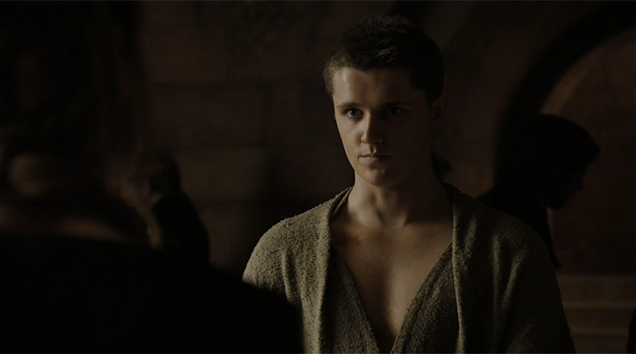 Cousin Lancel, now one of the Sparrows (a religious order), is wearing a threadbare robe and a very short haircut (which suits him actually). When they are alone, Lancel asks her forgiveness for their “unnatural relations” and what happened w/ the King. (Yes, I knew he had something to do w/ it! Lancel probably poisoned Robert’s wine before he went out on that boar hunt in S1.) Well, Cersei is not happy to hear this spoken out loud- watch out, Lancel! 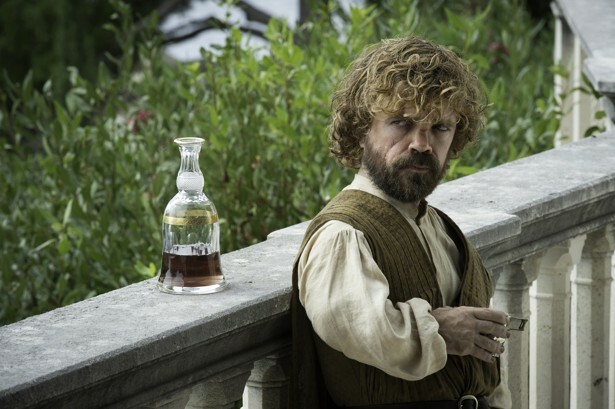 A very depressed Tyrion wants to drink himself to death- calling himself a “coward.” Varys disagrees, saying that Tyrion can have an important role in deciding who rules the Seven Kingdoms. There is someone he should meet in Essos (Dany, of course)! We learn that many people in Yunkai want “the fighting pits” to be reopened, though Dany thinks it’s barbaric. Later on that night. Daario (still don’t buy this actor, Michiel Huisman, in the role) tells her how he saw sold by his mother (a pro) into slavery. In time, he became a good fighter (“I wasn’t big, but I was quick…”) in those pits, earned money for his master, and eventually was freed. Dany is worried about ruling, but also about Drogon, (“hasn’t been seen in weeks.”) When Dany visits the two other dragons, this huge head comes out of the dark and breathes fire at her (scary and effective)! 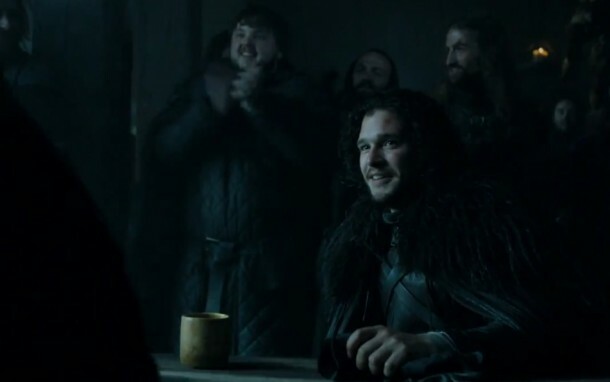 When Jon comes in to talk, Mance (Ciaran Hinds, underused on this series) already knows what Stannis wants. “I’ll never serve him,” Mance says calmly. Jon tries to change his mind, telling him to “think of your people.” (Jon has become more serious- good to see!) Mance explains that the Wildlings follow him b/c they respect him; they don’t care about Stannis.